The first time I went aground I did the job completely and thoroughly and stayed parked in the riverbank for twenty five very long and embarrassing hours. I had taken three weeks off and had decided to explore San Francisco Bay as carefully and extensively as I could while afloat. I had read about the joys of river sailing up the Petaluma River where I was told the breezes were constant and air temperatures approached tropical, an alluring prospect to one used to sailing the frigid Central California Coast. 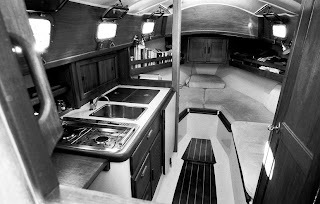 At first it all went beautifully to plan starting with an overnight trip from my home base at the Santa Cruz harbor overnight to Half Moon Bay in my twenty foot pocket cruiser, a Flicka built by Pacific Seacraft, then in Santa Ana, California. I made my way to San Pablo bay carefully following the charts and I turned toward the Petaluma River motoring up a long row of markers stuck on posts above the thick brown waters. Much to my astonishment I could occasionally see the bottom in the eight to ten feet of water. I felt very daring taking my three foot draft into such thin water over a sandy bottom. By the time I passed under the road bridge and found myself in the river itself two things became apparent: one was that the famous land breeze blowing down the valley was right there but unexpectedly the river views were miserable as I found myself locked on river bordered by tall riverbanks, levees in the local parlance, tall enough to contain the river at flood but also tall enough to obstruct all views. This was not what I had imagined, picturing myself sailing lazily up a brook between meadows, sharing the afternoon sun with cows and fields of pasture and whatnot. So I did what a sailor does and I started sailing. I am going to tack up river all day if I have to, and great fun it was too, in flat water with a fresh breeze on the nose. The Flicka was a fine boat to sail being small enough to make single handing simple, sheets to hand a stout tiller and a responsive cutaway full keel. Except...I seemed to be having difficulty coming about, a pronounced reluctance to spin through the wind alerted me to the fact that a change of plan was in order but I was too slow. Suddenly, very suddenly the boat got a mind of it's own and chose to ignore my efforts on the tiller by driving itself into the reeds at the river's edge with the determination of a Samurai hellbent on self destruction in some glorious act of self sacrifice. Unfortunately my dignity was the only thing offered in sacrifice that day in distant 1987. The Flicka plowed those reeds apart like Moses crossing the Red Sea and we came to a gentle halt in glutinous dark mud clamped all round the hull perching the boat bolt upright in the muck. 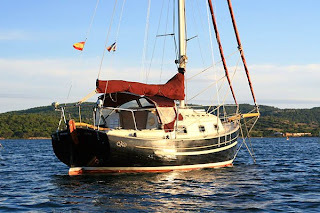 I of course lowered sails as the boat wasn't heeling one bit, The ten horsepower diesel was no match for the muck and soon I found myself sitting in the sun on a perfectly level sailboat with a splendid view of the many and various weekend afternoon activities on the water. And all of them could stare back and giggle at my predicament. I was released eventually by a cheerful power boater ("stink pot" as we sailors derisively term them) who gratefully took a bottle of wine for his trouble. I was pathetically in his debt as I had tried all the textbook maneuvers to get out of the mud and failed - kedging with an anchor, trying to dig the mud out from under the boat with a paddle, and waking up at the top of the moderate high tide in the middle of the night in a hopeless effort to motor smartly out of the mud. Nothing doing, it took a ski boat with a monstrous large outboard to un-stick the Flicka. As California has a steep and therefore deep coastline the chaos I suffered on the river was about as much experience as I would get in shallow water until I went sailing in Florida and the Bahamas three years later. I trailered the Flicka to Texas and motored round to a new job in Tampa. After I wore out my welcome I set off for the Bahamas with my girlfriend at the time. It was an unhappy journey as I felt the responsibility keenly to keep my little home afloat and safe not just for me but for her as well. 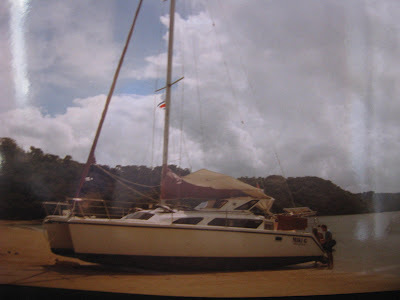 Our relationship did not survive the cruise but my boat and my sailing ambition did. While in the Bahamas I came face to face with my worst fear: shallow water. 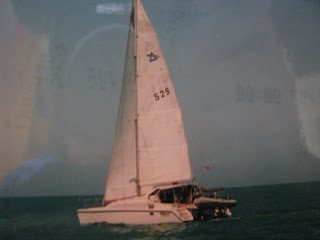 I sailed with determination and awful memories of 25 hours aground in the Petaluma River. To my amazement I did okay. I was scared, and scarred, but I piloted the shallows of those lovely crystal clear waters. 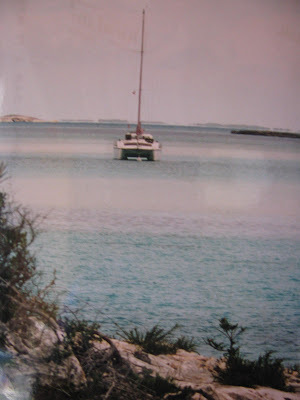 I had the best sailing of my life in the Bahamas, thanks to the steady breezes and close knit islands. For the first time ever I really didn't much need a motor. It is possible to take all day to sail a few miles, following a late breakfast and before the obligatory sundowner drinks, that sort of a "day" not sun up to dusk....Some short tacks in water barely deeper than your keel, the splash of an anchor and settling down for a swim and drink in the silence of an engine-free day. The Bahamas can offer the best sailing even if ashore there is nothing much to see or do. To visit the Family Islands not on your own boat seems a waste of time to me. 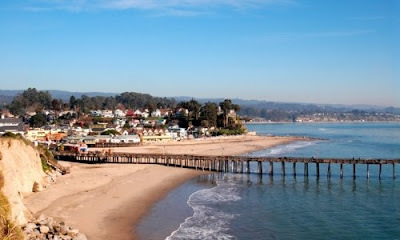 My wife and I wanted to sail level so we bought a catamaran and kept it on San Francisco bay in the mid 1990s, traveling upo from Santa Cruz most weekends, learning to handle strong winds and powerful currents and cold breezes. 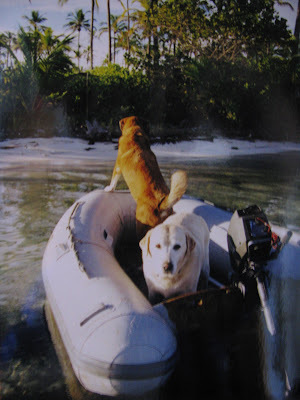 There was method to our madness for in 1998 we took off with our two dogs and aimed squarely at the Panama Canal with final destination my old hunting grounds of Key West. Which I suppose makes the choice of a boat with an 18 inch draft rather odd as the coastline is mountainous and the waters are deep right up to the beach almost all the way from San Francisco to Panama City ( and beyond from what I've read). 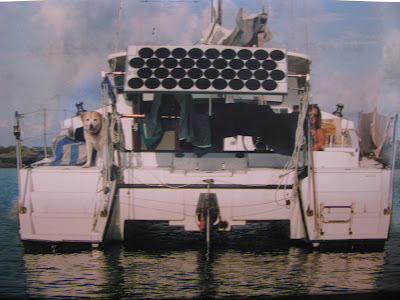 But there was no doubt our 34 foot Gemini catamaran was light, easy to sail well and very comfortable for us and the dogs. Debs ready to leap off to chase something while Emma always kept an eye on me. Eventually it happened that shallow draft became not just nice to have in certain uncertain anchorages, Belize's coastline comes to mind mostly shallow and full of reefs, as well as the San Blas islands all very deep except where they suddenly were't...mostly we sailed and anchored in deepish water. On the very final leg of our two year trip to Key West we met the second major storm of the journey, strong winds and large seas in the middle of the Gulf Stream south of the Dry Tortugas. One boat in our group hove to, stopped in the stream to wait, while we and another smaller catamaran similar to ours turned tail and fled for the Cuban coast. I had no desire to sit like a duck in the path of one of the world's busiest shipping channels. We found refuge in Cuba and that was where I finally learned to embrace shallow water. The couple fo who sailed See Ya, another Gemini catamaran showed me the way ahead, threading inside the reef along the north coast of Cuba, in waters protected from the storm, too far from land to be interfered with by officialdom. I watched the rocky bottom of Cuba's reef slip underneath my gaze with just a few inches to spare under the keels of the catamaran. When See Ya ran aground the crew laughed, and I tittered nervously alongside. They got off we proceeded. They dodged rocks and slipped through narrow passes, they watched the bottom and ignored the flimsy fake charts we had copied from some other Cuban wannabe visitor. I had never wanted to visit the Forbidden Isle wrapped up as it is in bureaucracy and ill feeling from our officials but there I was and in almost no water and having the time of my life. I have never had any mentors in my life and every crazy idea that passed through the antechamber of my brain had to mature and express itself by my will power alone. To be taught how to sail the shallows by an almost stranger was a gift and I took the lessons with gratitude. Much easier than learning to sail a river by being stuck aground for 25 hours in the mud.